Well, Elizabeth began her Saturday with a 2 1/2 hour nap in her swing. We left for the church around 11:45. Elizabeth has hated car rides since she was born and this one was no different. She wailed going to church and was rather upset by the time we got there. Fr. 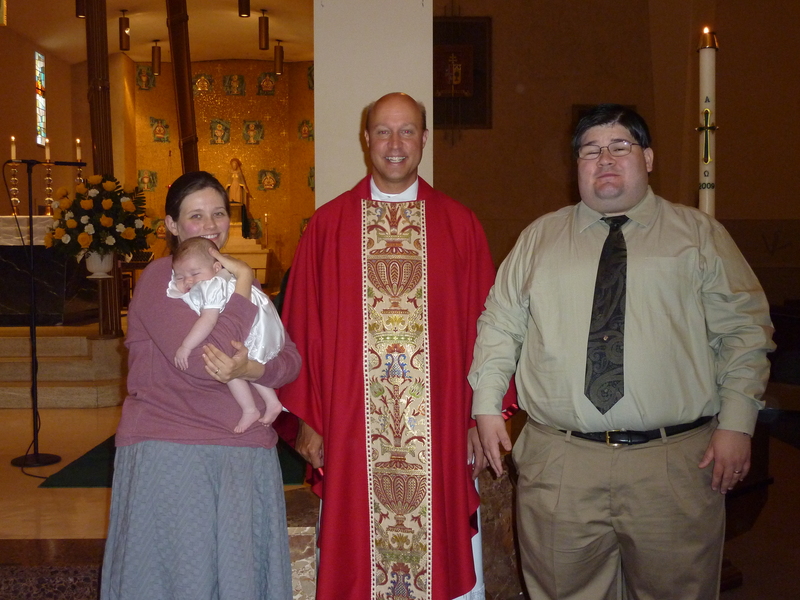 Nick graciously agreed to baptize Elizabeth within a mass. 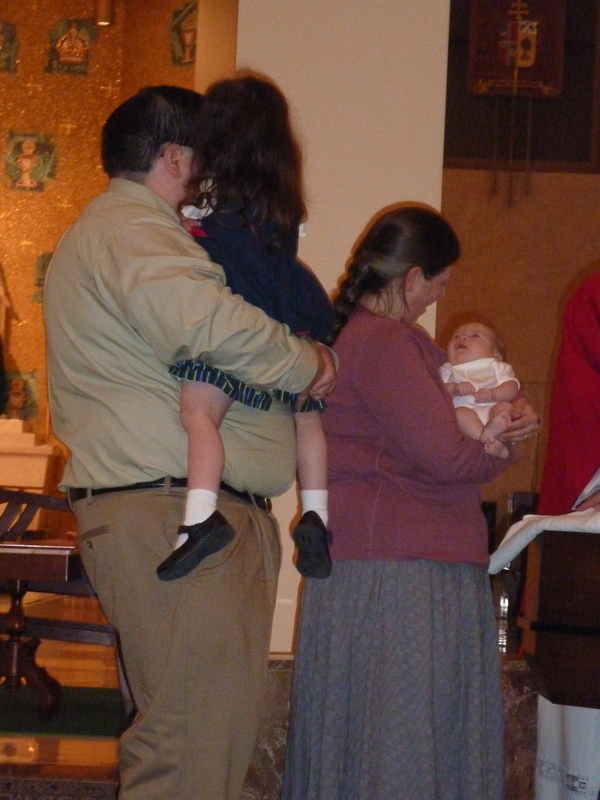 Elizabeth fell asleep on my shoulder early in the mass but her nap was not to last long. 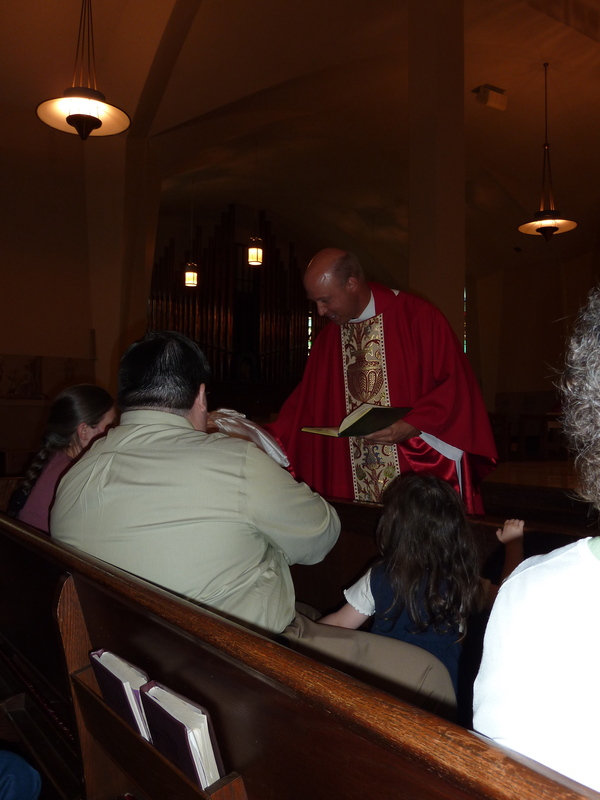 By the homily she was fussing and it was all I could do to keep her from crying. 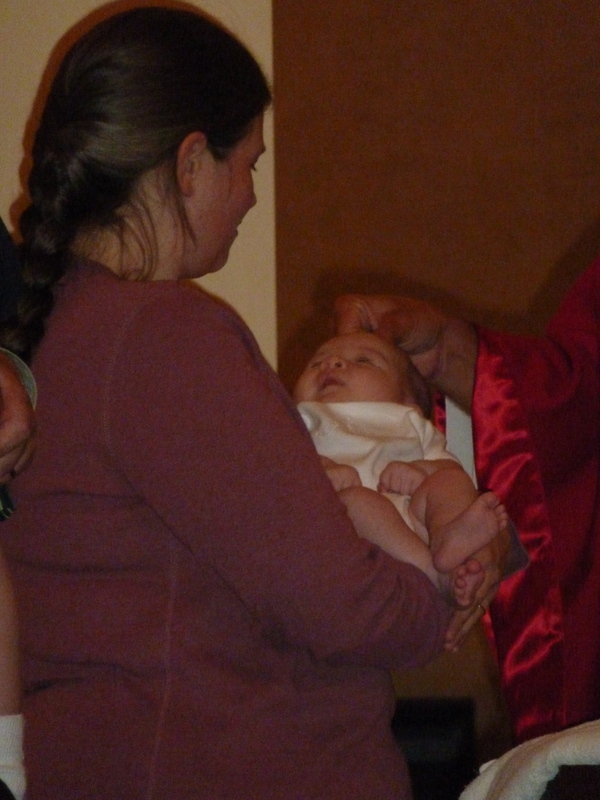 When it came time for her to be Baptized, she was still fussy. 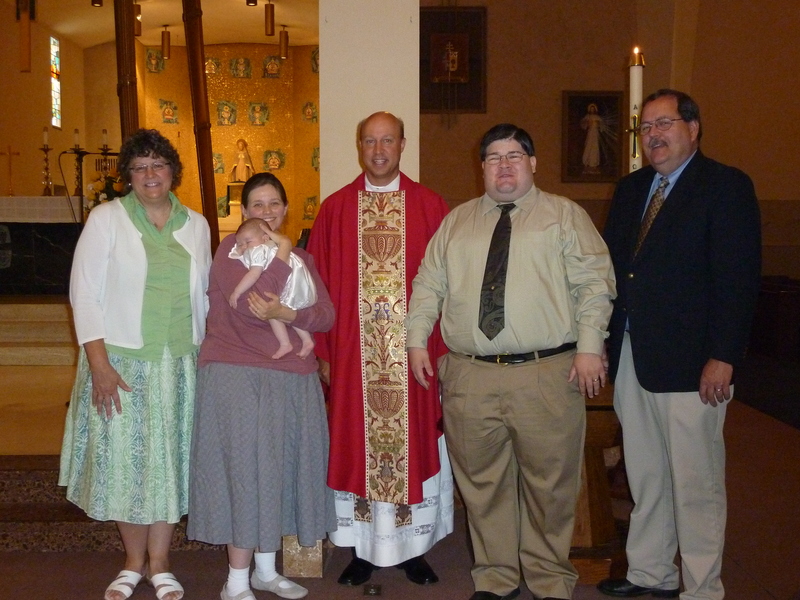 As Father poured the blessed water on Elizabeth's head, she startled. By the second pouring, she was calm. And by the third she was gazing off toward the ceiling of the church away from me as though something suddenly claimed her attention. I don't know what she was looking at but it struck me at the time. Both Cecilia and Felicity had been very calm until the water was poured onto their heads and then they panicked and cried. Elizabeth was crying until the water was poured and then calmed and seemed almost pensive. I was so fascinated by this sudden change in her I could not take my eyes off her. She remained completely calm afterwards. She gazed calmly when she received the chrism oil on her head. I love the smell of that oil. I cannot smell her head enough. I dread bathing her. 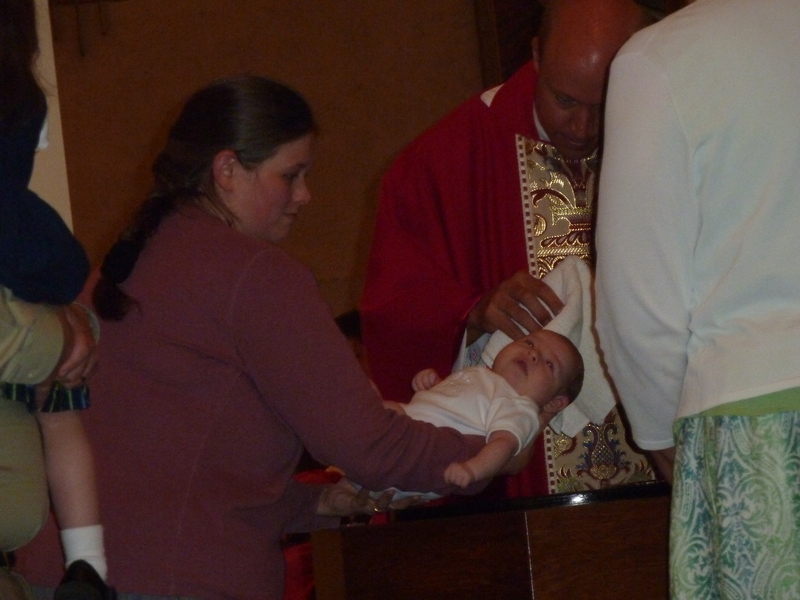 Once a baby is baptized, the little one is then clothed with a white garment. 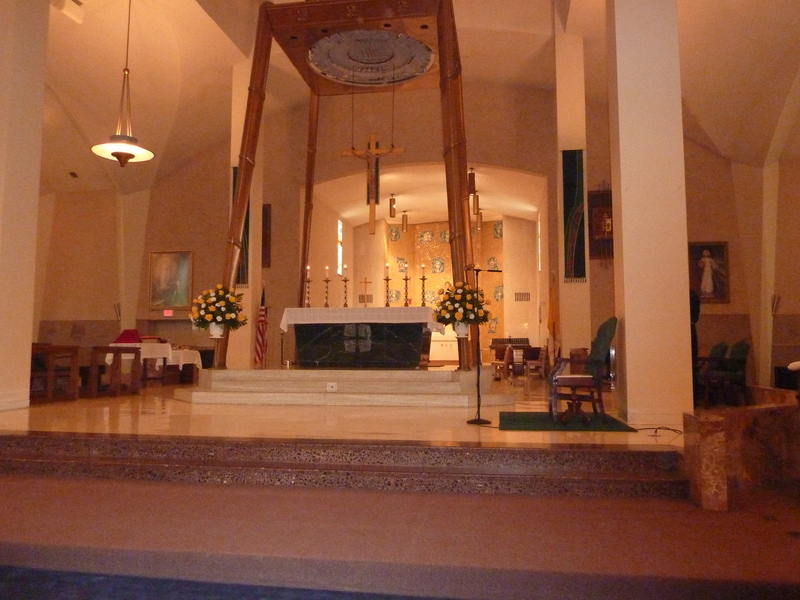 The church can provide a small white cloth to meet this requirement. Our baptism outfit is two pieces: Elizabeth wore a white onesie with a cross embroidered on the chest and, after being baptized, Father presented her with her beautiful white gown elaborately decorated with swirls and crosses. James helped me put it on her. I must note that she has been amazingly improved in her car rides since her baptism. Elizabeth Agnes was born on the nativity of John the Baptist and was Baptized into Christ on the feast of his martyrdom into glory. 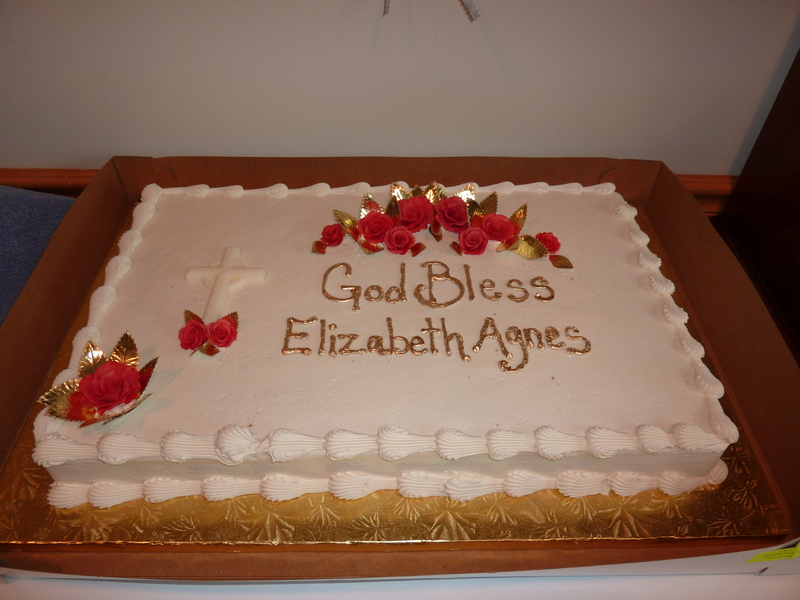 Congratulations, Elizabeth and God Bless you always!